In September, 1983, Tami Oldham Ashcraft and her fiance, Richard Sharp, were hired to take a 44-foot yacht on a 4,000-mile journey from Tahiti to San Diego. About halfway through their cross-Pacific journey, they ran into Hurricane Raymond, a tropical storm which had been building in power for a couple of weeks. They struggled to control the yacht in 145-knot winds, and Sharp was washed overboard, lost in the mountainous seas. Ashcraft had a head injury, and the yacht was badly damaged, but she managed to jerry-rig a sail and then navigated her way—manually, using a sextant and a watchover 1,500 miles to Hawaii. It took her an astonishing 41 days. She survived on peanut butter. In 2002, Ashcraft wrote a book about her experience, Red Sky in Mourning: A True Story of Love, Loss and Survival at Sea. "Adrift," the film adaptation directed by Baltasar Kormákur, wears its heart on its sleeve. It's not just a story of an incredible feat of survival. It's also a love story, presented with the subtlety of a sledgehammer. When Richard (Sam Claflin) and Tami (Shailene Woodley) meet in Tahiti, she's working in a marina, a girl already somewhat "adrift" but not really worried about it yet, and he is a yacht-owner who wants to sail around the world. Their love story involves jumping off cliffs, random laughter, and a conversation about flowers. There's not much substance to it, and the script (by Aaron Kandell, Jordan Kandell, David Branson Smith—apparently, there wasn't one female writer in a 4,000-mile radius who contributed to this story of a woman alone at sea) is low on subtext. The two speak their feelings bluntly ("I sailed half the world to find you"), with music swelling up on cue. All of this is pretty standard stuff, and forgivable, really. Nobody's looking for intricate relationship subtlety in a movie like this. What we're waiting for is the storm. The film starts with Tami lying injured in the interior of the yacht after the storm. The cabin is filled with water and debris. She staggers onto the deck, only to find Richard's safety line dangling overboard. She thinks she sees Richard floating on a dinghy in the distance. Filled with determination to get to him, she mends the yacht as well as she can, pumping water out of the cabin, fixing the sail. She eventually makes it to the dinghy, and—with a superhuman effort, drags the injured Richard through the water back to the boat, and somehow (Kormákur doesn't show us how) pulls him up the ladder onto the deck. His ribs are collapsed, his leg is badly wounded. Because this is a true story, we know Richard was swept off the boat, never to be seen again. So it's not clear at first if they have decided to fictionalize the story, or if she is having some kind of sustained hallucination. "Adrift" flips back and forth between their burgeoning romance on Tahiti and the increasingly dire situation after the storm, as Tami struggles to keep herself and Richard alive. It is she who makes the decision to turn north and try to reach Hawaii, as opposed to continuing on to San Diego. It is she who rations out the food. When problems arise, she has to figure out solutions. She hovers over maps, peers through the sextant, makes calculations, all while battling dehydration (and possibly a lingering concussion from her head injury). 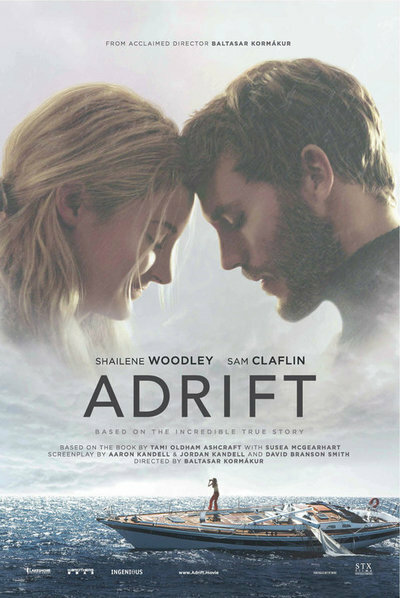 "Adrift" shares many similarities with "All Is Lost," the 2013 film starring Robert Redford, with some crucial differences. Redford is the only person in "All Is Lost." There is no dialogue. He doesn't talk to himself, to let us in on his thought process. There is no "Wilson" like in "Cast Away," a device allowing the stranded character to verbalize his feelings. "All Is Lost" takes place in a vast and eerie silence. We don't know anything about the character, we don't know why he's out there alone, we don't know his onshore life. All we do is see him try—step by gritty step—to survive another day. "Adrift" avoids many of the challenges "All Is Lost" faces head on. Kormákur is drawn to stories about feats of survival ("Everest," "The Deep"), and the sea and its storms feature strongly in his work (much of which takes place in his home country, Iceland). He's on familiar turf. Cinematographer Robert Richardson, a frequent collaborator of Quentin Tarantino, Martin Scorsese and Oliver Stone, does tremendous work with "Adrift." The frequent aerial shots of the tiny yacht surrounded by immense ocean are chilling: the frame looks almost existentially empty. There's one dizzying scene in Tahiti where first Tami and then Richard leap off a cliff into a deep pool below, and it seems like Richardson must be perched out in mid-air beside the cliff (and when Richard jumps, the camera follows him all the way down). The sunsets ooze fiery colors, with the yacht in black silhouette in the foreground. This must have been an extremely rigorous shoot for all involved, and Kormákur has maintained remarkable control over the images. Shots match, even as they're filming out in open ocean: the weather, the sky, the height and dip of the waves in any given sequence, all maintain consistency. The storm, when it finally comes, is an extraordinary piece of filmmaking and effects. In an interview when her book came out, Tami Ashcraft was asked about whether or not the storm depicted in the film adaptation of "The Perfect Storm" was an accurate depiction of what such a storm is like. She replied, "There wasn't enough spray and the wall of water was a little hokey." There's nothing hokey about the storm in "Adrift" (Dadi Einarsson supervised the visual effects). As the yacht surfs up the side of a mountain of water, the entire background of the screen is filled with heaving ocean. There's no sky in sight, just flailing waves the size of three-story buildings. And they clearly listened to Ashcraft, because the air is filled with spray, splashing against the camera. It's chaos. The entire scene is a screaming nightmare come to life. There's minimal chemistry between the two actors, who aren't given much to go on in terms of who these characters are. It's hard to "buy into" the Great Love they're "selling" here. But there's a fascination in stories like these, stories like "Touching the Void" or "And I Alone Survived." What human beings will do to survive, facing a Mother Nature who seems to have a vested interest in killing them, is, yes, awe-inspiring. It makes you think, "How would I face such challenges? Would I be as resourceful as Tami? Or would I give up?"